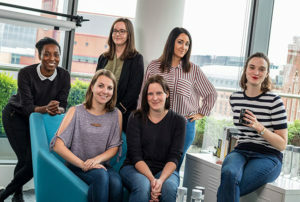 (Clockwise from back left): TechAdvisor.fr Editor Marie-Laure Calcar, Spanish B2C editors Alba Mora and Sara Piquer Marti, TechAdvisor.fr Editor Caroline Vanier, IDG U.K. B2C Group Editor Marie Black and Ecommerce Editor Ashleigh Macro. For the past year, IDG UK’s editorial team has been using its experience with data-driven content strategy to launch French and Spanish-language consumer sites from its London office. Tech Advisor France, PCWorld Spain and Macworld Spain have been growing rapidly, offering inventory for IDG Global Solutions and delivering media, third-party and ecommerce revenue. The initiative began when the team recognized similarities between top-performing content for the IDGC’s consumer publications in the U.K., the U.S,. Germany and Sweden. At last count all four business units saw seven of their top 10 stories — measured for revenue and audience — serving the same audience needs. Soon thereafter, Egan and IDG U.S. & U.K. Publishing Director Simon Jary set out to launch a French-language version of IDG U.K.’s Tech Advisor site, which targets buyers of all experience levels across the whole range of consumer technology. TechAdvisor.fr has a site code that is a clone of TechAdvisor.co.uk, so that Online Development Manager Adrian Black and the U.K. development team could build it from an idea to a live site in just three weeks. U.K. B2C Group Editor Marie Black worked with Ecommerce Editor Ashleigh Macro to identify the 100 most valuable pages in terms of advertising and Ecommerce revenue across Tech Advisor U.K. and Macworld U.K. Then the team hired two talented French-speaking, U.K.-based editors who were new to this type of project — Caroline Vanier and Marie-Laure Calcar — and set them to work culturally translating those pages. Their goal is not straight language translation, but understanding what need each story serves, and writing the best possible version of that story for the local market. A good example would be an article titled “Best mobile network.” A translation of U.K. or U.S. network information would be useless for a reader in France or Belgium, but the structure and underlying utility of the story would be the same. The results have been startling, Egan noted. Since launching with zero users in June 2017, TechAdvisor.fr reached 650,000 users by April 2018. That gain happened without any marketing or paid referrals; 90% of all page views come directly from organic search.